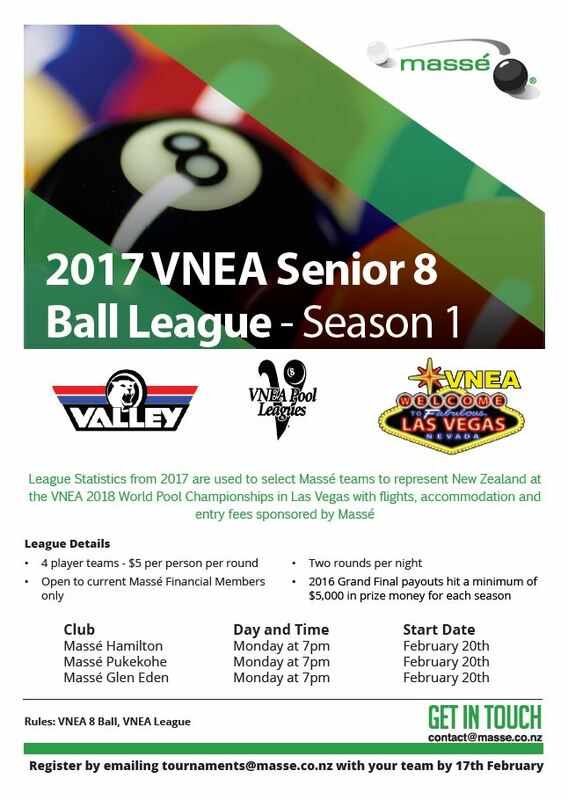 The Massé Senior VNEA 8 Ball League is back for 2017! The popular league starts on February 20th with registrations of teams closing on the 17th of February. This is our favourite league as we get to send our top ranking players to the annual VNEA World Pool Championships held in Las Vegas, United States! Since this league is so popular, each year we have found the need to send more and more players along to the championships as the talent of our members is only increasing. Players that are selected to represent New Zealand and play at the VNEA World Pool Championships get their flights, accommodation and sanction fees all sponsored by Massé Incorporated. Make sure you have registered your team and compete every week so you can gain as many points as possible. If you can’t get a team together yourself, just email tournaments@masse.co.nz and we will put together a team for you. Top players from each Club will get selected after all seasons have been completed for the 2017 year.